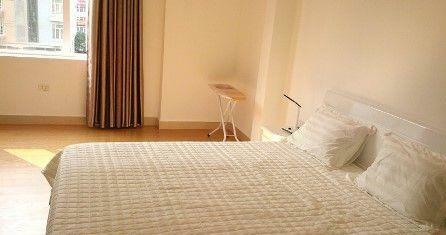 Serviced apartment with one bedroom for rent in Dich Vong, Cau Giay, Hanoi. Construction area is 57 sqm, consist of a bedroom, a bathroom, a living room and kitchen. The living room is combined with the kitchen on 1 surface. The apartment is equipped full furniture: soft sofa, tv, air conditioner, washing machine, wardrobes, cooking stuffs,….| Price: 700 usd/month Please contact me at 0936 670 899 or huong@bdsmekong.vn for more information. Nice and fully furnished apartment is in Xuan Thuy street, Cau Giay district. It has really good quality furniture and good service such as: security, cleaning service, wireless internet, cable TV, fresh water.